Please join President Bodnar at one of two scheduled Campus Updates on Tuesday, March 19, in the University Center Ballroom at 11:30 a.m. and 3:30 p.m. President Bodnar will discuss current efforts and will outline progress related to our five priorities for action. 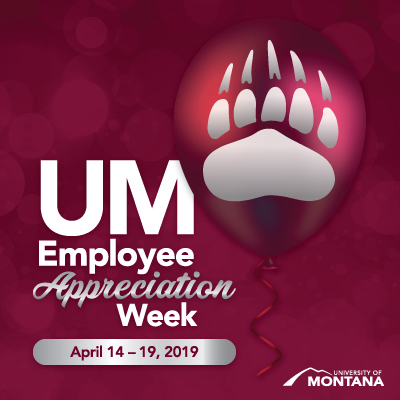 We all work together to make the University of Montana the great institution that it is. UM Employee Appreciation Week, an event designed to promote unity across campus, celebrates the impressive contributions of all UM employees to the University's success. UM welcomes Ambassador Michael McFaul as the next speaker in the President's Lecture Series. 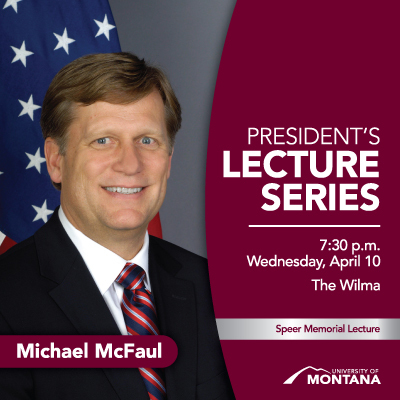 McFaul's lecture, titled "From Cold War to Hot Peace: An American Ambassador in Putin's Russia," will take place at 7:30 p.m., Wednesday, April 10, at The Wilma in downtown Missoula. A UM education has the ability to transform the lives of our students and empower them to create substantive and positive impact in our state, our nation, and the world. Our excellent sciences, arts and humanities, and renowned professional schools prepare students not only for success in their firstjob, but also for the challenges and opportunities that will arise over the course of a career in a dynamic world. When I consider the most important issues facing society today, it’s clear that addressing these challenges requires an interdisciplinary approach, where scientists and scholars who have dedicated their lives to the study of policy, expression, and human understanding come together to examine a problem holistically. This is where I see the greatest hope for our future, and this is exactly where the University of Montana excels. I am eager to work with you to continue to hone our strengths, and I will work tirelessly to communicate the tremendous value of a UM education. The University of Montana acknowledges that we are in the aboriginal territories of the Salish and Kalispel people, a number of whom are our colleagues, students, and friends. Today, we honor the path they have always shown us in caring for this place for the generations to come.